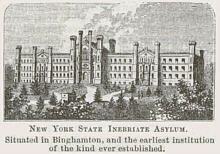 "The New York State Inebriate Asylum, designed for the medical treatment and restraint of inebriates, is situated in Binghamton, New York. It was founded in 1858. 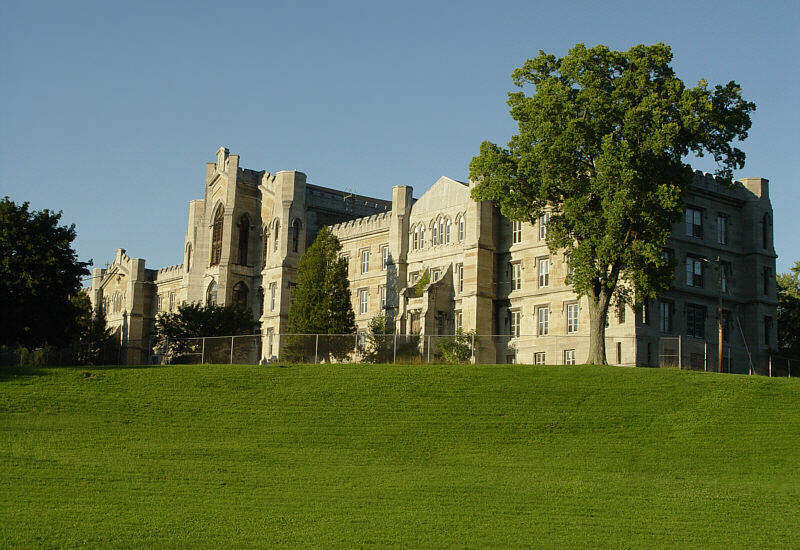 The building is on a beautiful elevated site east of the town upon a farm of 250 acres; it is three hundred and sixty-five feet long, eighty-two feet broad, built of stone and brick, in the Tudor castellated style of architecture; and presents an imposing appearance. This institution owes its origin mainly to the energy of Dr. J. Edward Turner, and is the first of the kind ever established in the world. It is founded on the theory that inebriety, like insanity, is a disease, requiring like that, for its cure, medical and moral treatment... The petitioners to the legislature, for an appropriation for this institution, and the subscribers to its fund, represented more than fifty percent of all the property of this great and prosperous state." John W. Barber and Henry Howe, 1861.